Between the early nineteenth century and the beginning of the Soviet period, there was an extraordinary flowering of the art of ikat textile weaving in Central Asia. Although ikat has come to be known as the national fabric of Uzbekistan, its original development involved widespread adoption of this striking fabric by Uzbeks, Tajiks, Jews, Turkmen and Kyrgyz (during the nineteenth century, the nomadic Kazakhs were known as ‘Kyrgyz’ while the Kyrgyz were known as ‘Kara [black] Kyrgyz’.) Virtually every ethnic and religious group in western Central Asia used ikat for costume and décor and was involved in the production and marketing of the cloth, although it was produced primarily in what is now the Republic of Uzbekistan. Ikat was made in the southern region, in the cities of Bukhara, Samarkand, Tashkent, Khiva and the town of Kokand in the fertile Ferghana Valley to the east. The oasis cities were fairly small, densely packed urban centres surrounded by many miles of gardens and orchards interspersed with dwellings. Intensive agriculture had been practiced for millennia in these oases, and wealth was calculated largely in terms of land. The merchants of these oasis cities carried goods to Russia, Iran, India and as far as Siberia, just as their ancestors had travelled the great Silk Road from China to the shores of the Mediterranean. By the nineteenth century overland trade had diminished, but textiles were still the primary commodities carried by camel caravan. In the early 1800s Bukhara had the most active trade, surplus wealth and formal guild structure – and the first classical adras ikat production. The oasis towns were populated by Uzbeks, who had held political power for several centuries; Persian speakers, who considered themselves the most ancient inhabitants of these places; a minority Jewish community; and an Iranian population that included many former slaves. The larger oasis towns were each ruled by a khan or an emir, the smaller townships by feudal lords. The kingdoms were politically stable and strong in the first half of the nineteenth century, but during the latter half their lack of political cohesion allowed Russian troops to conquer them one by one. The new economic structure that brought the oasis kingdoms into a central Russian administration is reflected in the changes in the textile trade over the 100 years of active handmade ikat production. 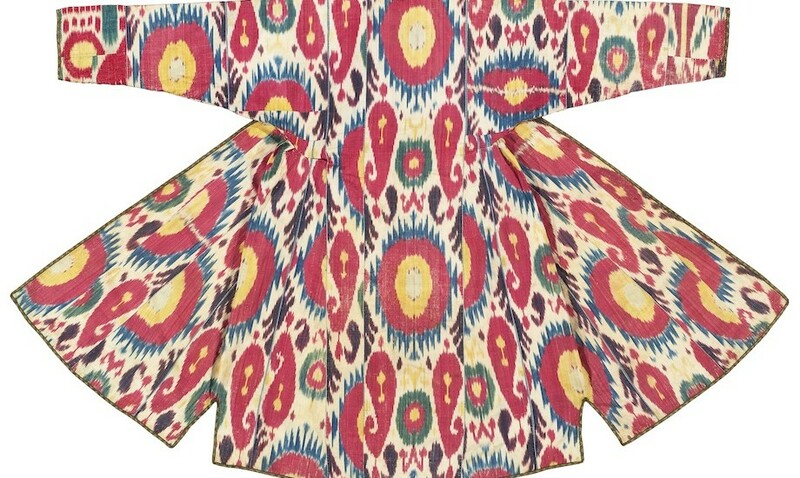 Ikat was almost entirely the work of men. A whole variety of specialised craftsmen performed the various stages of the ikat-making process. Women were involved in ikat production only in the earliest stages. They raised their own silkworms, feeding them the leaves of mulberry trees from home orchards. The best-quality cocoons were eventually sold in the bazaar to make silk cloth. In the bazaar, male workers boiled the cocoons, teasing individual threads out with a stick and then reeling them directly from the pot. These threads were combined to make a multi-filament warp thread, which was then wound onto a hand-turned wooden frame. The original warps were up to 200 m long and were cut into more manageable sections of about 15–20 m before weaving. The plain warps were divided into lots of thirty to forty warp threads. Each group was threaded through a board with many holes pierced in it. The threaded board was wound tightly around two wooden struts, so that many layers were set very closely atop the other. Adras ikat was woven in quite narrow widths. Altogether, there were about 2,000 warp threads in a 30 cm-wide section of finished fabric. The pattern to be tied onto the threads was marked on the tensioned warp with a sharpened stick dipped in charcoal. The master craftsman’s assistant then bound the warps with cotton thread, so that each bundle on the frame contained that warp’s width times the number of warp layers. When all the areas of warp for the resist had been wrapped in cotton, the warp was removed from the patterning frame and brought to a dye house for its first application of colour. After the first dye-bath, the partially dyed warp threads were returned to the designer’s workshop. They were unbound, stretched again on the patterning frame for another set of ties and then returned to the dye-shop for the application of another colour. When the warp was completely dyed, the patterns on the threads were manipulated and made symmetrical by dividing the threads in half and placing them so that one of the original edges became the central vertical axis, with the pattern appearing on either side. Sometimes several divisions of the warp were made to multiply and narrow the pattern before the warp was placed on the loom, or sections of the warp were moved up or down in relation to one another. Adras ikat was woven on a very simple, warp-weighted loom. Two treadles raised and lowered the two warp sections. Adras ikat fabric was finished by beating the surface with wooden mallets or polishing it with a heavy glass semi-sphere. One face of the fabric was often glazed with egg white to give it gloss and shine. The loom for silk velvet ikat was more complex and involved five harnesses instead of two. Clothing showed rank and status within the rigidly structured societies of the oasis towns. The wealthiest people tended to wear either ikats and embroidered silks and velvets, and/or imported fabrics. Wealthy merchants and warriors are often depicted wearing ikat robes. Many photographs taken in the towns’ bazaars and great squares show men dressed just as colourfully, but in the less prestigious cotton fabrics typical of ordinary urban dress. In the nineteenth century, men and boys often wore several robes at a time, one on top of the other. Robes were cut wide and folded to close, frequently showing a decorative lapse of contrasting ikat fabric in the lining. Those from Bukhara usually had a firm T-shape, with wide sleeves. Robes worn in other cities were less voluminous and often had narrow sleeves. Only the half-silk, cotton-wefted adras fabrics were meshru (‘permitted’) for men by religious tradition. In Central Asia’s gender-segregated urban society, a few young men worked as entertainers for men’s festivities, dancing and singing in imitation of women. These boys wore long hair and dressed in clothing appropriate for young girls. The boys also wore the lighter-weight, all-silk ikat fabrics usually worn by women. Lush harem settings are often seen in posed photographs, Russian versions of the odalisque popular in Orientalist European art. Nevertheless, such images are an accurate reflection of the idealised Central Asian home environment. Textiles were essential to the decoration of the home in the nineteenth century. Hangings adorned the walls, cushions served as chairs and padded cloth mattresses served as bedding. Meals were taken upon a cloth set on the floor. Home use of ikat textile decoration was not determined by a person’s ethnic background or religion; ikat decoration was a widespread urban style, and the choice of pattern and form were influenced by fashion in the town in which they were made. Women in the cities were cloaked from head to foot in padded robes, and wore dark horsehair veils. Beneath these, well-to-do women wore layers of brilliant silks and satins, and those who could afford it wore ikat. The public dress of Jewish men was restricted to humble materials, but in the home the sumptuary laws were cast off. In photographs of affluent Jews taken in the nineteenth century, families were dressed entirely in silks, and men wore heavily ornamented silver belts. While women’s robes were often indistinguishable from those of men, certain types of robes were distinctly feminine. The munisak robe was the most luxurious garment in the dowry of a bride. It was cut to fit the figure but was worn on top of all other robes, over the head like a cape, by the bride at her wedding. Later, women wore their robes over colourful layers of thin, unlined silk ikat dresses. Children were largely exempt from restrictions on clothing. An 1880s photograph of Jewish children at a synagogue school shows almost every child in a rich, silk ikat dress. Although ikat belonged to the commercial milieu – to the world of the bazaar and trade fabrics – it was quickly adopted for very traditional textile uses such as the dowry; decoration for the marriage bed and the bier; and costume for the most sacred family rituals. The 1871 Turkestanskii Album prepared for General von Kaufmann, the first Governor General of Russian Turkestan, includes photographs of wedding and betrothal ceremonies among several ethnic groups. In one image from Samarkand, representatives from the families of a Jewish bride and groom examine ikat silks, which formed the dowry of the bride. Active trade with the steppe made ikat readily available to nomads as well as urban peoples. The earliest photographs of steppe peoples, from about the 1860s, show them wearing and using ikat. Early sources note that the various ethnic groups preferred specific colours and patterns: fine fabrics with yellow colours were dominant among Jewish inhabitants, red and black among the Kyrgyz and so on. In Central Asia, except in certain field patterns in Turkmen tribal rugs signifying tribal identity, designs do not usually have specific symbolic meaning or significance. Ancient patterns, variants on old themes and designs made up on the spur of the moment are given equal, often arbitrary placement and weight. In general, even traditional, homemade textile arts are extremely creative and individual in design and do not follow specific, set patterns. There are many familiar forms in ikat design that appear related to the scorpion and bird shapes found in rural embroidery, or that echo the garden-like constructions of urban suzani with gigantic floral forms. However, designs that have some significance or meaning in other textiles lose those meanings entirely in ikats. There are no totems or signs of family or tribe. The makers of ikat have rejected identity and value in individual designs in order to embrace formal considerations of composition and colour. Geometry is one means of composing and understanding ikat surfaces. In ikat, ‘geometric’ decoration occurs as a figure repeated regularly. Geometry in ikat design is usually implied rather than explicit, and is often built on curving, vaguely floral forms. The various manipulations and divisions of the warp to increase the number of pattern repeats also bring a more symmetrical structure to ikat composition. Stems, tendrils and blooms are constrained within regular pattern repeats. Tension and variety depend upon the interlacing of other repeating patterns and on scale. The combination of different ikats in a single wall hanging or garment often seems to reflect the layering and blending of patterns found in Central Asian architectural tilework, in which bands of geometric tile end abruptly. Floral patterns are so highly abstracted that they express the burgeoning energy of a spring garden or the feeling that you get when you look into the heart of a flower. The clarity, saturation and depth of colour in classical ikats are their greatest artistic strengths. The eye is teased, tickled by the sophistication of the composition and the elegance of the forms. Viewers may become lost in an ikat’s intertwining motifs, but it is colour that truly entrances them. Each unique ikat is the work of an individual who thought deeply about his every choice of colour and form in order to build a harmonious composition. There is always a concern with negative and positive space, for the placement of each pattern and its corollary. We can see the risks that the anonymous ikat designers took and trace their response to each step of the dyeing process. In their way, each ikat is a discovery of a new kind of order. This article forms part of a Guide to Ikat, which covers classical ikat, Soviet faux ikat and contemporary ikat. 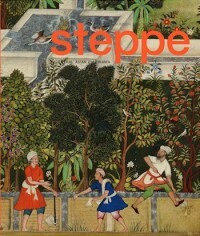 The rest of the guide is available when you buy Steppe 6. Kate Fitz Gibbon’s books on Central Asia’s textiles include Ikat: Silks of Central Asia and Uzbek Embroidery, The Nomadic Tradition, both with co-author Andrew Hale.